How did you find TTM? A Quinn Martin Production - ain't it? Troy Donohue is dead - but CBS radio kept running the theme from Warner Bros. "Hawaiian Eye" detective show under the story the other day. Duh - he was on "Surfside 6" instead. My client, GoodLife TV, did it! Every Saturday night in Oct. will run back to back episodes of Surfside 6/Basin Street Beat/Hawaiian Eye/77 Sunset Strip! On Sundays will run Sugarfoot/Cheyenne/Maverick and one other Warners' '50's western. Plus the old corny FBI show with Efrem Zimbalist, Jr. 6 nights a week. The FIBBIES always wore suits and ties on the show. Yeah and hats too - even in shoot-outs! Sugarfoot (Will Hutchins) has his own web site and internet radio show. I don't recall Inspector Erskine mussing his hair with a hat. Found some old Griffin's coffee spots but can't find a B&W Don Woods promo - will send on VHS to webmeister Ransom to grab some "more" stills from. Oh, yeah a lot of Anita Bryant singing Coke spots too! Dam! I forgot all about Shotgun Sam's! Though us TUers felt like we owned the Ken's Pizza on Admiral just east of Harvard - goooood pizza, cheap beer and a jukebox loaded with CCR tunes in the early '70s. 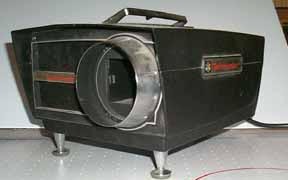 I NOW remember those Technicolor projectors - selling cameras in the 1960's folks often brought them in for repair - we couldn't do it. How did you find TTM? Puttin' my stamp on Hamp! Hamp Baker for Dog Catcher! Any of you remember former OK Atty General Jan Eric Cartwright? His name was a punster's torture device in news - whether to producers or by editors or engineers to producers. Like a producer might ask for some general video of him - "You want some GENeric JAN Eric Cartwright footage?". Or as heard at a KOCO TV newscast by a producer to an editor pulling file footage - "Gimme some generic footage of the AG with Gov. Nigh. Then give me :30 of footage shot today of Jan Eric Cartwright with Tom Daxon announcing a probe of tag agents." An editor asked - "You want Generic Jan Eric footage then specific Jan Eric (say it in Okie patois like GEN Eric) footage of the AG?" Brainwaves would short circuit if you were new to Oklahoma names - "Generic generic? Generic Specific? Then it ain't generic!". Arggggh! And don't forget Wilburn Cartwright...his father? Just added new pics to Stevo's comments below, be sure to check them out. I remember the Sipes Grocery Store at 61st and Yale had one of those Kiddie Movie Booths, and whenever my mother did her grocery shopping, my brothers and I loved to go with her so we could get free coffee and sit and watch cartoons and the old silent black & white comedies. Yes, the Sipes Cartoon Hut at Eastgate (Admiral & Memorial) was discussed briefly in Guestbook 84, but you've fleshed out the topic a good bit. I know Jack Hobson well; I worked directly with him at Sabre for a number of years. If it were not for Professor Dumit, I would have never been able to muddle through my many articles on Tulsa Opera over the last year (being raised by a pianist and organist, I never got much of an education in vocal music). Memories from conversations we had twenty years ago at T.U. have kept me from sounding like a damn fool when speaking to the many singers who come through town each season (instead, I just sound like a regular fool). It's good to know you're around, Professor. Location: By the cash register at Nelson's, apparently. Hot Dang, Hoo Boy, and Shazam! I've been fortunate enough to receive a few honors in my life, including an Emmy, but I can't think of one that made me smile more than hearing I'm on display at Nelson's. My thanks to the people who did such a nice thing. My chicken-fry affection/addiction, is more than old enough to vote now, and having traveled the world for CNN, and gone all over the country as a broadcaster, I still can't think of anywhere I'd rather be for lunch on Wednesday than under the big neon sign, feasting in that historic Tulsa eatery. This is indeed a signal honor. Next visit to Nelson's, I'm taking a camera. I was just at Nelson's Buffeteria downtown (I would probably injure someone just to get their chicken fried steak), and noticed something I never saw there before. On a column in front of the register is a article from the Washington Times about our own John Hillis, who proclaimed Nelson's as his favorite restaurant. I wonder if it isn't this profile of John in the Photo Briefcase. Erick replied: That would be the same profile. How did you find TTM? Quite by accident-glad I did! I remember moving down to Van Buren from Connecticut back in 1970 and getting cable TV for the first time. We really loved KTUL and ran home after school to see Uncle Zeb (remember the ads with the "Friendly OTASCO Toyman"?) To Carl Bartholomew I raise a "Dad's Rootbeer" in salute. "I'll be lookin' for ya!" Here are some other beverage choices for the toast. Location: You'd never believe it. How did you find TTM? You'd never believe it. To confirm or disprove the comments of other esteemed contributors of this fine guestbook, I drove out to the West Edison UHF location to see for myself and, yes, it is true - Weird Al's TV station is gone. The drive and parking lot remains but now there is a portable barn-style building and a tower (cell, I guess) that seems to be sitting right on the site of the old building. As Mike Ransom has mentioned, KOKI (Channel 23, Cox cable 5) took the Jerry Lewis MDA telethon this year, but not without a couple of glitches. First, the station may have given the newspaper wrong information, for TV World appeared Sunday showing the telethon starting on KOKI at FIVE A.M. Monday after being off the air from 1:30 to 5 a.m. (and regular schedule before that). Actually, KOKI joined at the usual time in the 10 or 11 p.m. Sunday area (I was late). Unfortunately, the lads on the control board at Cox ran the volume so low it was difficult to listen to and especially annoying to have WGN (also carrying the telethon on Cox Ch. 4) and KTUL blasting out at the same volume setting. I started to use my other set for "over the air" reception, but decided to take my chances and call Cox to complain. They must have received other complaints, too, because by the time I woke up Monday the show was at confortable volume and finished in good shape. I'm not aware of any direct connection between Oral Roberts and KVOO (AM or TV) other than for the time he probably purchased years ago. Oral Roberts University now has its own TV station, KGEB on UHF Channel 53, with mostly religious programming except for a few Kansas City Royals baseball games (NOT the full schedule). At the time, I thought the volume problem due to the remote feed, but evidently it was either at Cox or the station. No, it wasn't Doc (who was also at KVOO and who did Sleepwalker's Serenade). This dude was Bill (I believe) something or other and it was at KAKC, a fact I can attest to since I used to look through the glass from the control room as I ran the board for his dumb program. By the way, this board is really prim. I tried to submit this message earlier, in which I referred to "that damned (dashes removed) glass with the straw inserted into it" and was given a rebuke that I was using "rude words." Man, you should hear my really rude words. Then, when I tried to add this little tidbit, I got the same message so I had to use dashes. I trust we are all safe, now. Ha! I checked and you're right, there is a filter active. I just un-damned it. Sorry for the proxy rebuke. Jim Ruddle's question about the duck......it wasn't KAKC, it was KRMG and Doc Hull. He had a rubber duck and used a glass of water to insert the nose of the duck into and then squeezed.....hence the sound. The duck's name was "Gertie". Welcome Ed Dumit, can't believe you survived all us "students"
Now that the subject of soap operas has been broached, let me add that one of the queens of the daytimers was a Tulsa Central grad: Mary Stuart (Houchins). She starred as the lead character on "Search for Tomorrow" for more than twenty years. After graduating from Central (a Ronan pupil), she went to Hollywood where she was in a couple of movies, one opposite Errol Flynn--How the hell do you spell "Erroll"?? One "L" two "Rs"? Forget it. You know the guy. Anyway, she had a brief shot at the movies, then went back to New York and got into television. Her brother, Guy, was a few years younger. Here is Mary Stuart Houchins' filmography at IMDb, a bio, her autobiography, and a link to the New York chapter of Bookpals, of which she is the chair. Bookpals is a national organization of actors who read stories aloud to children. It was founded by Barbara Bain of "Mission: Impossible" and "Space: 1999". KTBA & KKUL were completely separate stations. KTBA was located in Broken Arrow and KKUL was located in North East Tulsa. KKUL switched formats from R&B to Progressive Rock around 1975. Oops. I'll amend my comment below to avoid confusion. Is the funk station in question KKUL? Didn't the Horn Bros own a African American Oriented radio station in the '70's? Callsign had something to do with KOOL, KUEL or some soundalike callsign, like KTEW for Channel 2. I remember one of our ex-cameramen (also hosted a Sunday nite African American show when Lem Schofield was Program Director at KOTV) from KOTV was a DJ there. He called the controlroom late one night when there was a really heavy T-storm and asked Clark Wilson and I what to do since the transmitter room was flooded. We told him go home and get a good night's sleep. He didn't want to mess with a wet transmitter and no FCC license. Since the studio and Xmitr where in the same location was that the "UHF" site? As David Bagsby says, I think that was KKUL, which Stevo notes was in northeast Tulsa. The "UHF" station, KGTO, is in west Tulsa. "Solid Gold Soul" KGTO was formerly big band, oldies, and before that, religious, as KFMJ...and probably other formats in between. A guy I work with says the old radio station that served as the U-62 station in "UHF" was indeed torn down....he says he thinks it was torn down earlier this year because it served no purpose. Just FYI. KFMJ-AM 1050 used to have both its transmitter site and studio there decades ago. Maybe they tore down the studio part of it, or maybe Weird Al added a facade for their shots. Sonny or Lowell, do you know? It may be time to head that way with a digital camera. The station now has call letters KGTO with a "Solid Gold Soul" format (pretty good listening). How did you find TTM? Finally found the light at the end of the tunnel! Edward Dumit announces his entrance into the 21st century! Effective immediately, he has e-mail and is in residence at edward-dumit@utulsa.edu! "But seriously, folks," it's great to have access now to the media memories of so many former students, classmates, and associates. It's been a long, wonderful journey from my first broadcast in 1935 at the age of 5 on KVOO's "Kiddies Review" from the Jenkins Music Company auditorium (I recited the immortal poem, "I had a little pig"), weekly appearances throughout the 5th and 6th grades on KVOO's "Junior Playhouse," frequent parts on Central High School's "Experimental Theater of the Air" on KOME, regular shifts on KWGS throughout college at TU, and my first commercial job at KWON in Bartlesville to my retirement from the TU Communication faculty 8 years ago and my second retirement in May of this year from producing and hosting broadcasts of the Tulsa Philharmonic Orchestra and OK Mozart Festival. Now I relish the opportunity of catching up on your memories and experiences and sharing a few of my own. Hurray! People have been asking about you since this site started, Edward, which you will see if you type "Dumit" into the search engine. We're all looking forward to hearing more from you. How did you find TTM? Good with Nelson's Buffeteria world renowned chicken fried steak! Hey, kids. 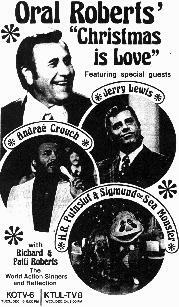 Ain't it yet time again for another Jerry Lewis Labor Day Telethon Sunday and Monday?? I worked them at 8 and at 5 in OKC many a moon ago. Is anyone carrying it in Tulsey this year? I also remember a famous 8 MDAA staff trip to Vegas (no I was then a lowly projectionist and NOT part of the entourage) for the yearly pre-event planning/training sessions. John Chick had been winning big at the tables in Vegas. Then lost like $6000. John came back worried and got busy getting all the "talent" work he could book to try to recoup all. He also got busy shooting model "head shots" - he was a talented photographer and had good contacts with a talent/modeling agency or 2 - doing model portfolios or headshots. I am guessing in the hay days at 8 and even with his show - John probably never made more than $40,000 a year - this $6000 would have been a big hit on his finances. John worked hard for everything he ever made... We never knew if his western wear clothes were a trade-out from Tuf Nut or just his personal taste. John said some places in Eastern OK he would never have to worry about a check in a restaurant or a drink. No, he was not a free-loader - just folks were high on him! "Their friend" from TV. KOKI Fox23 is carrying Jerry this Labor Day. Paul Shaffer, David Letterman's bandleader, used to tape the whole thing to catch all the show biz "moments". I didn't know that John Chick was a professional quality photographer. Thanks for the timely comments, Mike. I will have to say that I really do enjoy your weather website:) This whole site is just great! It is great to see how much the people care about Tulsa television! TV FANS: You are about to see a lot of changes in Tulsa television! Stay Tuned! Thanks, Mike...we'll keep an eye on 8. There is a link to TV Guide listings for Tulsa on the Links page along with other local TV links. You can look at broadcast only, or cable, by genre...it takes a few moments to come up but it's pretty useful. TV Guide has a large presence in Tulsa, and occupies the old Kensington Mall where Weird Al shot "UHF". Will the two hosts be profiled at the bottom of the screen, making wisecracks about the stupid dialogue? If anyone wants to see a modern day "worst of all time", try renting "The Haunting". Eeeww...what a turkey that flick is. I kept picturing the guy and the two robots taking potshots at the grade school lines that thing had. Channel 2 has selected hosts for their new local show, "World's Worst Movies": Rick Rutledge and Rachelle Renee. "WWM" premiers Saturday at midnight, September 15 with "The Brain That Wouldn't Die"...read more at the KJRH site. KOKI Fox23 is looking to hire people in all capacities for their start-up newscast. Adding to the trivia glut: Regarding the DuMont Network, a former TU'er, Hal Hamilton, worked as a booth announcer for the net back in '52. Hamilton had been in the navy at the end of WWII, attended Northwestern for a couple of years, then came to TU. He was working at KOAM, in Pittsburg, KS as a summer announcer when he heard of an opening at another local station, the powerful, 250-watt (on good days) KSEK. He told me about the job, I hitchhiked to Pittsburg and thus began my glorious adventures in commercial broadcasting. Hamilton wanted to be an actor and had appeared in several Northwestern and TU theater productions, and about '53 or '54 worked in summer stock in Pennsylvania. Later, say about '56 or 57, he had a major part in some CBS soaper that ran daily on KOTV, then quit that, it was said, and, as far as I know, vanished. Like the DuMont network. Hal Hamilton played "Tom Pope", a lawyer on CBS' "As The World Turns" in the late 50s, and "Sidney Fell", a university hospital doctor, on "Days of Our Lives" in 1965-1966. There is a Hal Hamilton who appeared in a couple of British sci-fi shows in the early 60s, but he may not be the same fellow. That's all I could find. In the process, discovered an interesting site for serious TV sci-fi fans: 625-Online. I'd never heard of many of these productions for British TV, and most are based on quality written SF. Mike, thanks for the link to my DuMont site. I should add that the Channel One page is not mine, but is a link to a page by Jeff Miller, who has a terrific site on U.S. broadcasting history. This site can be accessed through the Channel One page. I haven't updated the DuMont site in a while, but hope to do so soon, now that I have some time on my hands (most of the staff at WJJJ here in Pittsburgh was downsized a few months ago in favor of voice-tracking). Say, Clarke, take a look at this photo taken at KVOO in the 50s. Looks like an actor from the DuMont show, "Tom Corbett, Space Cadet". What do you think? KVOO-->KTEW-->KJRH is the NBC affiliate here in Tulsa. (Later...) Clarke passed the mystery picture along to an authority: Cadet Ed at the Solar Guard Academy. We'll see what he has to say. While working for Bro' Roberts (doing lites for the open of the Maybee Center), people were coming in & I-I-I wanted to final check settings. Couldn't get on stage so I went to the line-o-site rite behind the stage. Security preceded Bro' Roberts & Bro' Billy (Graham) & saw this Hippy-type dude! Indeed, Les Nessman did come to KOTV, during CBS' first run airing of WKRP. In fact, Nessman sat next to me on the 'swirling woody' (our set). I read the first sports story of the night and then, introduced a person auditioning for a sports opening at KOTV. The director then cut to a 'two shot' of Nessman sitting next to me. The guy read the sports, in character. He even had a bandage around his index finger, just as he did on the sitcom. Vaughn was totally unimpressed and told Nessman he had a nice TV show but it needed more exterior shots of Cincinnati. Still in character, Nessman stumbled off the set and promised to make a phone call to MTM productions immediately. I'll get back to you on the Akbar story. Please, Ken. Our breath is even more bated than if we were in the vicinity of Dr. X' wrestling togs. Hi there. I just acquired an old (1950's vintage) postcard of Oral Roberts University, and there's a picture of the KVOO building on it (the lettering above the door says "Radio and Television - KVOO," and "2 KVOO" is on the tower atop the building). Did Oral Roberts have something to do with KVOO? Hmmm, that's a new one on me...anyone? Clarke has an informative and interesting TV site: The DuMont Television Network, previously mentioned on this site. He explains why there is no Channel 1 for starters. He is also a well-known radio personality in Pittsburgh, Tucson and Phoenix. Way back in Guestbook 6, Clarke and I briefly discussed TV psychic Dazé, seen on Tempo Television in the 80s in Tulsa and Tucson (back when Miss Cleo was a mere pup). By the way, the Dance Party Pepsi machine came in handy for drinks when ya didn't have a quarter for the soda machine in the lobby. To answer Joy Cooper's question, the Dance Party tapes were reused at every taping when I was engineering there. It was a standard 12" reel, good for about 70 minutes of taping. There was a few clips saved for Mr. Bayley when Bill Southard directed his "air tape" ( an audition tape to send to other markets ). If Lee still has it in a closet somewhere, you will need a 2" VTR to play it. I had a bootleg of the Beatles "Let It Be" video and Bill used it in the air tape, because we had used it on a previous DP. Maybe Lee was the first VJ as well as DJ in Tulsa? OK, thanks, Roy. It doesn't get much more definitive than that. On a completely different subject, moving back to radio and KAKC, does anyone know what happened to the chief engineer named Buzz Donnelly? And, perhaps Noel or Frank Morrow can aid me here, who was the guy who did a daily show on KAKC and pretended to have a duck in the studio? He had a glass of water with a straw inserted in it and would blow in it from time to time to make what, I must suppose, was the noise of a duck. Man, that was the Golden Age of broadcasting! Hey, webmaster, do they still have tapes of the old Dance Party...I was on that show once...or have they all gone to video heaven or hell? I can remember how small the studio was..you just had to "dance" in one place and try not to bump into everyone...thanks again for the KAKC! There are some brief clips on the KOTV 50th anniversary show from 1999, but it is unlikely that there is any significant archive of the shows...the tapes were typically reused. 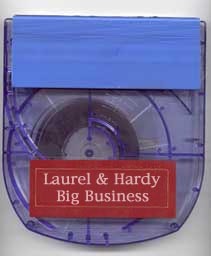 Lee Bayley or other KOTV folk might have more to say about that, but the tapes are probably, as you say, gone to video heck or heb'm. I could just close my eyes and believe I was tooling down Harvard in my Corvair listening to KAKC...the radio was about the only thing that worked on that car! You hear the songs now on "oldies" stations but it isn't the same as actually listening to the "patter" of your favorite radio station and disc jockeys...that sound becomes ingrained in your memory and that is true "oldies" radio like none other. I enjoyed the heck out of this, thanks webmaster!! You're welcome, Joy. Just added someone you may be familiar with to the new page. Skandar used the flame ball and I say that's no fair! Hey, Ken Broo promised a story about a "fireball" once lighting up Haystack Calhoun's beard. Calling Ken... You can read Ken's entertaining story about a Mr. Wrestling II interview and the aftermath here on The Rasslin' Page. There is a new Lee Bayley page for your perusal with 13 minutes of KAKC audio and pics of the KAKC Solid Gold album from 1969. Respected webmaster: Be that as it may, one's anonymity is for them to break, not a second party. I wasn't trying to correct what's already been posted, but a reminder for the future. One's affiliation with Alcoholics Anonymous is strictly his or her business/A member is beholden by traditions to not reveal his membership, on a public level. Even worse, is for a 2nd party to announce another person's participation. Revealing affiliation in AA is no one's right but the member's. The word is "ANONYMOUS". That should be a clue. That is something we want to respect, Noel. But Ben "Cooter" Jones has a link on his official site to a newspaper article from the Washington Post referring to him as a "self-described recovering alcoholic who was 'whiskey-bent and hell-bound'" just prior to landing his role on "Dukes", so he has gone public with this information. You may also remember Mr. Jones as a sidekick to "Lamar", a mutt featured in a very successful series of commercials for Tulsa-based QuikTrip. The role was post-Dukes, pre-Congress. There is virtually nothing about Lamar on the internet...surprising. How did you find TTM? Gabby Hayes tol' me, gol'dangit! Hmmm. Only vaguely recall Les Nessman. Seems to me we did a lot about the tape on the newsroom floor, and the turkey drop show. My pore ole brain just don't recall if it was just that Ken Ragsdale was always saying "Oh, the humanity," or if he did the interview, but I think it was a nonpareil disaster. Maybe someone like Broo with better neurons 'n mine will chime in. The celeb in studio that sticks in my mind was Barbara Mandrell one summer afternoon with Ken Ragsdale anchoring. Ken's tastes in music ran more toward Johnny Martin than Billy Parker, and it was a very looooong five minutes on the air. I know we never did an interview segment with Clayton and the Moose with Ben "Cooter" Jones, who represented the 4th district of Georgia for a couple of terms in Congress. Jones was smarter than the character he played on TV (be hard not to, I know, and maintain independent respiration), and wasn't a bad rep. He was beaten by a Republican candidate who later wound up being indicted, if memory serves, which it does poorly if at all (see above). I have driven by Cooter's place on Rt. 211 in the shadow of the Blue Ridge, not far from Luray Caverns, but didn't have time to stop and say "howdy." At least in the tourist-nostalgia business, he's paying taxes and not making laws. Was at the library recently and saw Roy Clark's autobiography. Clark grew up not far from where Cooter's hanging out now, won early fame for fancy pickin' and became part of Jimmy Dean's local tv show here in the Washington area, and later when it went network, both early morning and prime-time. How did you find TTM? At the bottom of a carton of Page "Golden Driller" ice cream - Yuuuum! We run "The Lone Wolf" an NBC 50's series with Louis Hayward as a former WWII hero/spy/accused jewel thief/crimefighter/contract govt operative (talk about job security!). I missed some high culture in the VA suburbs yesterday - no NOT Maurice Hines & a great national touring company of "Guys N Dolls" at Wolftrap. I missed the 1 day "DUKE FEST 2001" in Sperryville, VA. For the Dukes of Hazzard fans! Duh - weren't they from somewhere else South? Guess not now - Cooter, Daisy and I forget whom else attended. Gonna be a regular thang I hear but could not find a website on it...WTOP had an interview with "Cooter" who is really a former Congressman now living in VA with his wife. Who sez we ain't got culture here in Virginie?? BTW Cooter and his wife are Alcoholics Anonymous speakers and advocates in DC and nationally. Have been lauded for their work quite a bit here. Steve Wilkerson and his wife Andrea Baker were often headliners at the free Summer Starlight Jazz Concerts (led by Ken Downing) in the 70s and early 80s at Skelly Stadium. Steve was a powerhouse even then, fresh from the Stan Kenton Orchestra. Andrea was a Miss Green Country in the early 70s, and a Kenton alum as well. She became a nationally-recognized jazz singer, getting rave reviews from the likes of premier jazz critic Leonard Feather. Baseball/broadcasting was a big topic. There was an aside on jazz organ and a communiqué from one Hugh Jorgen concerning R-I-D-E-S-H-Y. Stevo further informed us about the music used on the Mazeppa show. Lee Woodward shared an anecdote about an early Rowan & Martin appearance on KOTV. Don Norton was wondering the name of the restaurant that had a deal with Cy Tuma (the caption "Your host, Cy Tuma" appeared under Cy's photo in the newspaper ad). Deb Walker returned to the Guestbook after a long absence with a Tulsa counterculture comment or two (soon to be the topic of a new page). The webmaster felt called upon to make a speech about parameters for Guestbook entries. Booker T. Washington as a magnet school was seen and mentioned. 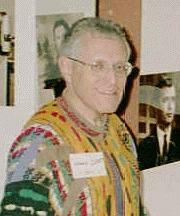 A new page about Rocky Stegman was added to the site. An outstanding query from Larry Thomlinson: has anyone heard from Dino Economos? Our collective food fixation continued to manifest itself with mentions of Ike's Chili (a menu was seen), Coney Island, Jerry's, Coman's and the Crosstown Grill. We began with a photo of a "Scream In The Dark" pass from the mid-70s.